The nebula associated with open cluster NGC 2467 in the southern constellation of Puppis is a young (<2my) stellar nursery where new stars are forming from dense clouds and dust. NGC 2467 is not one distinct open cluster, but is a superposition of very different stellar objects along our line of sight. The nebula contains the open clusters, Haffner 18 (center) and 19 (center right in bright red circular object). The bright star and the center of the bright pink area near the bottom center of the image is HD64315 (type O6), which is a massive young star that is helping to shape the structure of the entire nebular complex. The Spitzer Space Telescope identified 45 young stellar objects (YSO’s), or protostars, concentrated along the ionization fronts at the edges of the HII region. 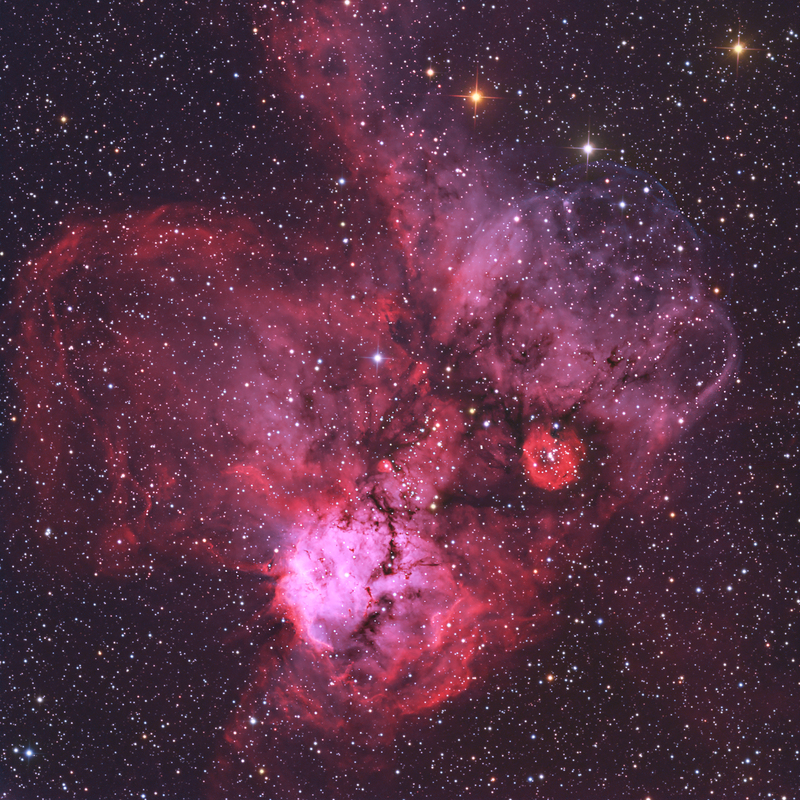 The bright pink region has dark dust lanes and Bok Globules, which are places of star formation. 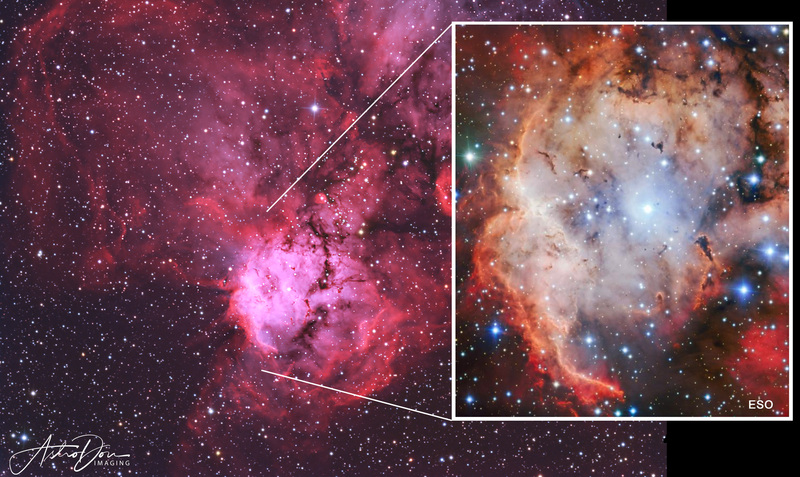 A comparison with an image from the ESO’s FORS2 camera on the Very Large Telescope in Chile is presented below. 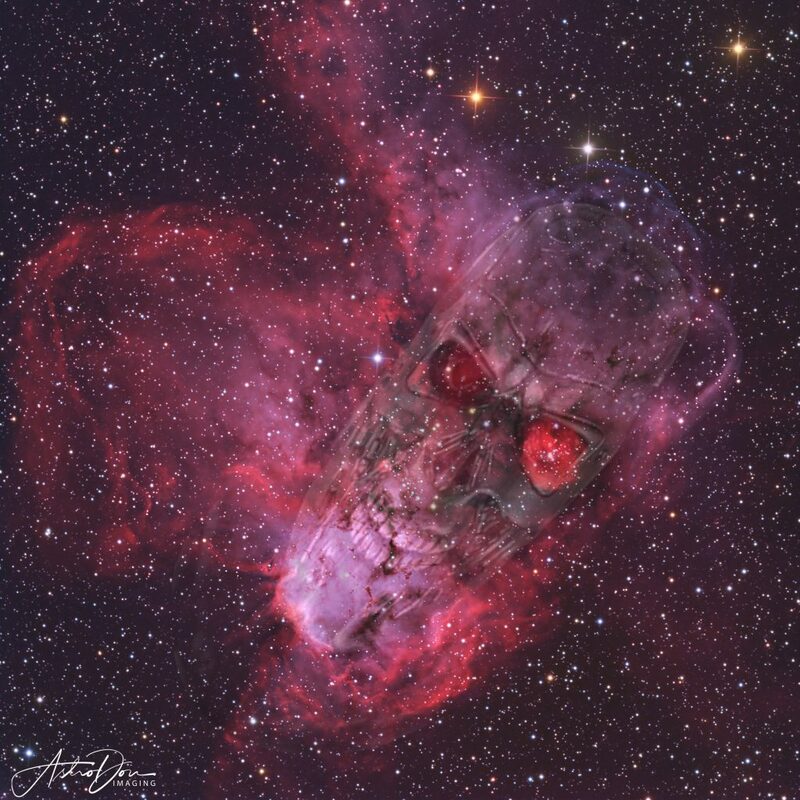 Lastly, you may wonder where NGC 2647 received its alias as the “Skull and Crossbones” nebula. With effort, I can see the skull with one eye centered on Haffner 19 at the middle right. The Crossbones escape me. However, I do see the robot’s face from the movie Terminator 2, and since we’ve left science aside for the moment, I thought that I would convey what I see when viewing this image (below). As a result, I believe a more fitting alias would be the “Terminator Nebula”.